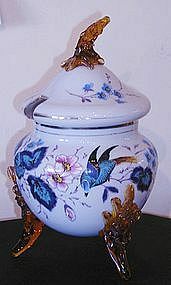 Beautiful English Victorian hand enameled covered glass tureen with birds and leaves. Legs and handle to lid applied. Condition is perfect. 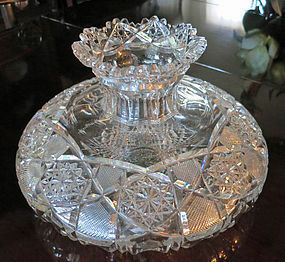 Six lovely signed Tiffany salts - with ten ruffles as opposed to the usual eight. Can be sold individually or as a set of six. They measure 2 1/2" wide x 1" tall and are all in perfect original condition. 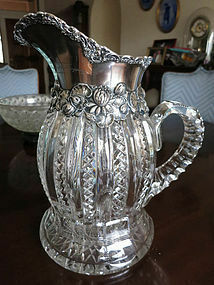 Lovely choice signed Quezal vase with ribbed sides and a ruffled top. 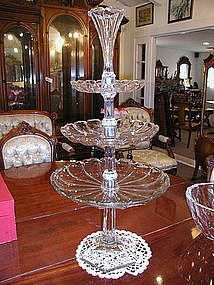 Measures 1 3/4" tall x 2 1/4" wide at its top and is in perfect original condition. 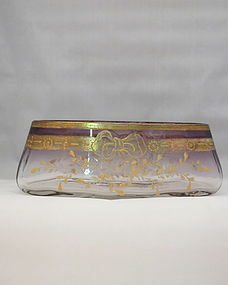 Signed, handpainted, Moser bowl, clear to amethyst with gold decoration. Minor wear to the gold, otherwise in perfect condition. Measures 2 3/4" tall x 6 1/2" long x 2 3/4" deep. 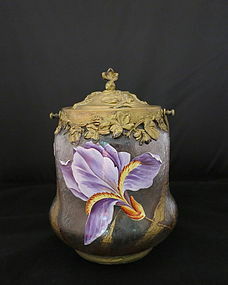 Beautiful handpainted biscuit jar, either Moser or Mt. 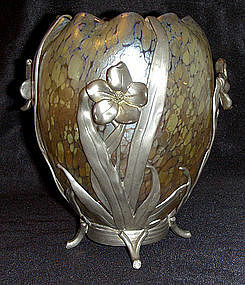 Joye, decorated with a large iris on the front and smaller one on the back. It is in perfect condition with no chips, cracks or repairs. The handle and lid, although they look good, could use resilvering. 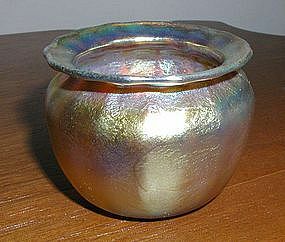 It measures 7 1/2" tall to the top of the lid x 5" in diameter. 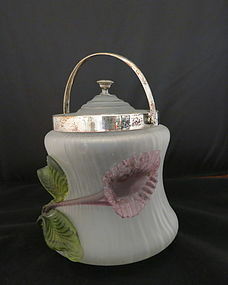 Lovely ribbed opaque glass biscuit jar with large applied glass flower on front. The frame needs resilvering, but the rest of the jar is in perfect condition with no chips, cracks or repairs. It measures 8" tall to the top of the handle x 5 1/4" diameter on the bottom. Lovely melon shaped Mt. 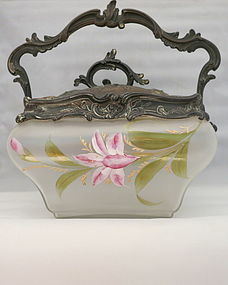 Washington biscuit jar with handpainted pastel flowers. 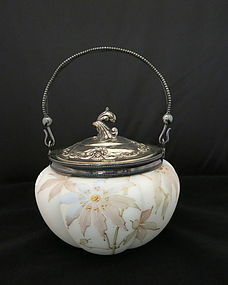 This jar is in perfect condition with no chips, cracks or repairs, and measures 5 1/" to the top of the lid x 5 1/2" diameter. 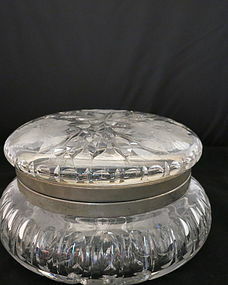 Lovely large hinged cut glass box with flowers on both top and bottom. It is in perfect condition with no chips, cracks or repairs, but the rim could use resilvering. It measures 4" tall x 8" diameter at its widest point. One of the loviest cups and sauces that I've ever had, there are two of these, which are priced individually. 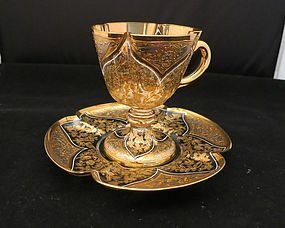 They are each painted with gold and silver decoration and are in perfect condition with no chips, cracks or repairs. 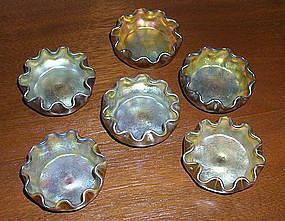 The cups measure 3 1/2" tall x 3" diameter, the saucers have a diameter of 5 1/2". Beautiful hand painted Mt. Joye vase measuring 12" tall x 5" wide. It has lovely flowers in pink, pale purple and beige, which look like they're blowing in the wind. This lovely vase is signed and in perfect condition.